I've written in the past how we try and contribute to raising funds for my son's school by creating games for the Christmas and Summer Fairs. 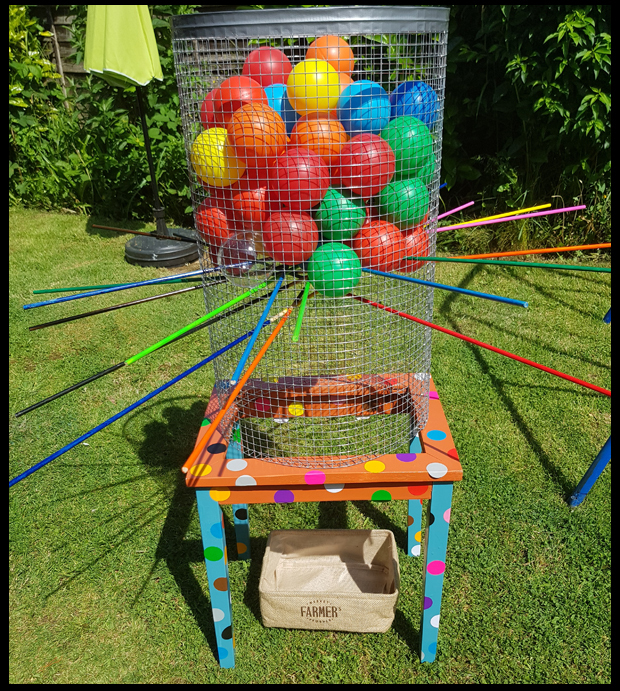 Well, this year is no different, this year I'd set my sites on creating a giant outdoor Kerplunk game. Yep, as soon as the sun came out, we were in the garden creating it! I try and recycle wherever possible, and failing that the charity shops before spending out on materials to try and keep costs down, after all, I don't pass this costs on to the school, they are so underfunded they need every 50p per game raised. Table - this was from a nest of tables which I got for free from a local free up group. 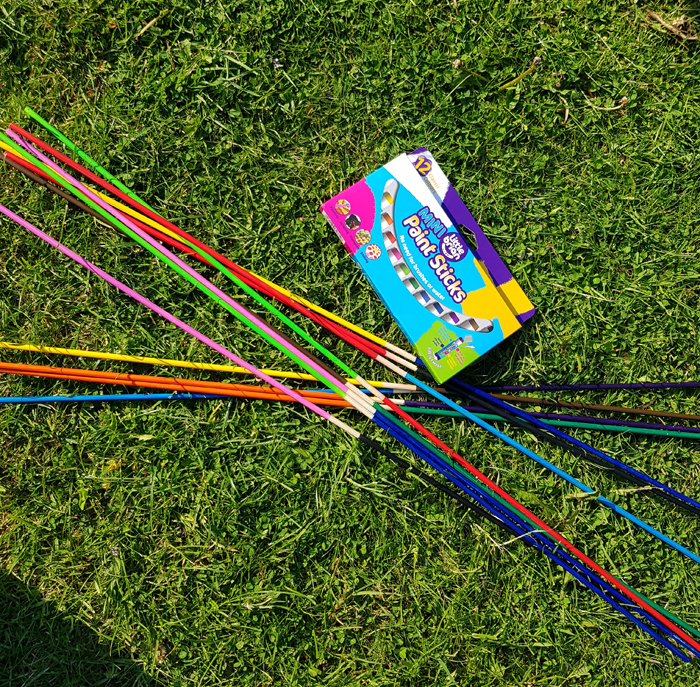 PaintSticks - perfect for covering the sticks with. Softplay Balls for extra fun we've added large baubles with prizes in! As this game is for Primary school children I want it to be as colourful as possible. Rather than having just plain timber coloured sticks, I opted to use the new mini Paint Sticks from Little Brian. They were perfect for cover the timber in the least amount of mess. 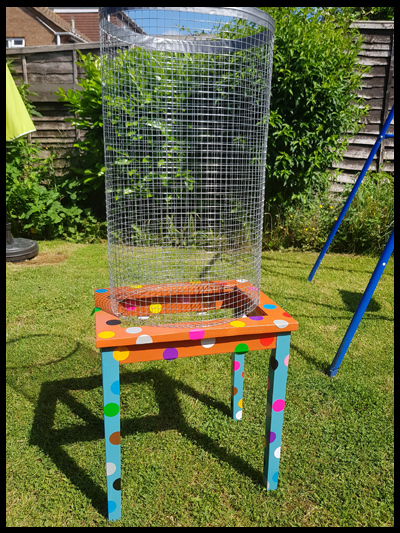 I bought cage mesh from Wilkos for £3.75 and used a bucket from home to keep the mould whilst we pinned then cut the wire to size. Because this is for children we had to be extra careful with every edge. The bottom was pinned to the table so that wasn't an issue. The top was smooth but to be extra careful we added tape, encase little hands made there way up to hold on. Finally, the joins around the middle were first bent round and then soldered to make them smooth. It is so important to ensure this game is safe from sharp edges, splinters and anything that may bring harm to anyone. 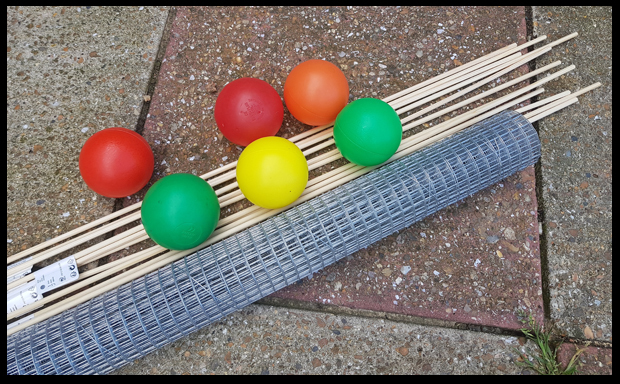 We needed 2 dozen sticks to ensure the balls are balanced well within the cage. The basket that we originally had to catch the balls was way too small, so we are going to use a larger Amazon box and recover it in spots to keep the theme. To show how our game is going to work, I have my chief tester show us how we hope it will work at his school fate. Wow... this is so cute and colourful. I really liked this. Thanks a lot for sharing this post.